A headpin at its most basic, is a metal stick with a horizontal piece on the end. This piece helps beads stay onto the pin. There are also decorative head pins which, instead of a flat horizontal piece, has a decorative stopper at the end. The stopper could be round, oval, heart-shaped, diamond-shaped, etc. These knob-endings can also sometimes be embossed with decorations and even with dangles. You can also make your own eye pins with the appropriate pliers like wire-looping pliers or even the roundnose/rosary pliers. 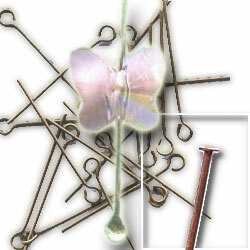 Both the head pins & eye pins are basic essential findings for jewelry making. They are used in many bead style earrings or for attaching beads to any type of jewelry piece. If you are into jewelry-making, you can't do without these!